Pitching Machines For Sale • Guaranteed Low Prices • Free Shipping! NOBODY BEATS OUR PRICES !!! At Pitching Machine Stop, we realize that choosing the right pitching machine or batting cage is a big decision and a considerable investment. We've tried to set up this website with resources and descriptions that help you get the perfect setup for your needs while still keeping a budget in mind. We are also aware that, with so many choices, things can get kind of confusing. If our pitching machine buyer's guide still leaves you a bit confused, definitely give us a call toll free at 1-800-651-7130 or submit your question via our Contact Us form and we'll do all we can to help you get the perfect pitching machine and/or batting cage for your family. Check out our most popular products, below, and be sure to scroll to the bottom of the page for more information about our company and navigating our website. At Pitching Machine Stop, all we sell are pitching machines and their related products. Unlike the big name retailers, we don't have to pretend to know a little bit about every sport and every piece of equipment that exists for those sports. All we need to know about is pitching machines and we know them well! If you are unsure which pitching machine is the best one for your family, definitely read our article, "How to Select the Best Pitching Machine." Because it can often be confusing knowing what balls work with what machines, we have included a section on every pitching machine's page, showing you exactly what pitching machine balls they are compatible with. We also have an article in the Resource Articles section that shows you why you might want to use each type of ball and when. If portability is your number one concern, the Louisville Slugger line of Ultimate Pitching Machines might be the perfect choice. Their machines weigh as little as 12 pounds and require no electricity at all - not even a battery! 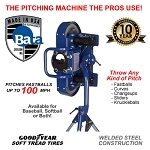 Their machines are the official pitching machines for Babe Ruth and Pony Baseball and Softball Leagues. 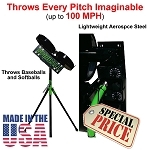 Zooka Sports makes pitching machines that are super portable and very affordable. No matter which Zooka pitching machine you choose, you can rest assured that it is lightweight, weighing less than 30 pounds including the tripod. Zooka machines shoot balls like a cannon on compressed air and run entirely on a self-contained rechargeable battery that lasts 500-800 pitches before needing a recharge. By no means wimpy, Zooka makes pitching machines that can throw up to 70 MPH. They are great for tennis, too! If you are looking for a cheap pitching machine for casual practice, we have the Heater Sports line of backyard batting cages and pitching machines for sale. They're great for parents on a limited budget and their fully enclosed housing ensures maximum safety. 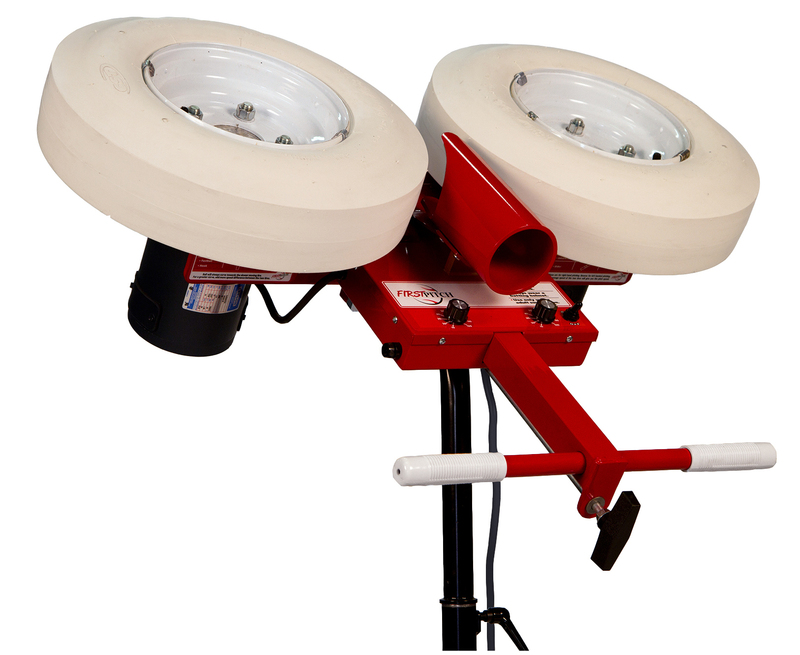 And, if you're looking for an automatic pitching machine, Heater's auto ball feeders are certainly the most affordable solution available! First Pitch offers perhaps the best value there is in pitching machines. 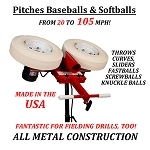 Their incredibly durable, all metal pitching machines are made in the USA and feature powerful Lesson/Minarik DC drive motors. Similarly made JUGS and Atec machines cost 2 to 3 times as much as First Pitch machines. With pitch speeds up to 105 MPH, there is no need to worry about outgrowing their top of the line machine! If precision and reliability are your main concerns, you cannot go wrong with a JUGS pitching machine. Built to last, they were the first manufacturer to offer 5 year warranties on their pitching machines and many players and teams say they have been using their machines for twice that long with no problems. 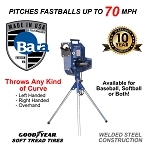 For those looking for a balance of durability, safety and the best warranty in the industry, we also carry the full BATA Baseball pitching machine line. Their machines have an amazing 10 Year Warranty. In addition, they use hard tires that last longer than pneumatic, air-filled tires and that do not need to be constantly checked for correct air pressure. The tires are enclosed so that it becomes next to impossible to get fingers or a shirttail caught in the wheels, too. Some of their machines can throw any pitch that any major leaguer can throw. It must be the reason many Major League teams are switching to BATA pitching machines! If you want the ultimate high tech pitching machines, the Spinball Wizard and Rawlings Pro Line pitching machines are about as good as it gets. All of their machines throw up to 100 MPH, have a patented ball and socket alignment clamp that allows you to change pitch locations in a single adjustment and are half the weight of other two and three wheel machines. On top of that, they, too have enclosed solid wheels like the BATA pitching machines. Add the fact that they are the only pitching machine manufacturer that includes the wheels in the 5 year warranty and you can see why they are the fastest growing pitching machine manufacturer. 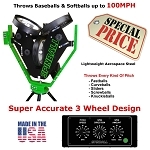 Their top of the line pitching machines - the Spinball Wizard 3 Wheel and the Rawlings Pro Line 3 Wheel - are so smart, you don't even need to set individual wheel speeds or angles for different pitch types - the machine does it for you! No matter what your experience level or ambitions are, the products offered here at Pitching Machine Stop are versatile and interchangeable, allowing you to practice a range of pitches in a variety of settings. Many of our pitching machines include automatic ball feeders so that you can experience the freedom of continuous pitching without needing another person - some even feature remote controls. With features like pivoting housing, adjustable speed, pitch height and curve controls, you can customize pitches to target the areas of your game that you really want to work on. 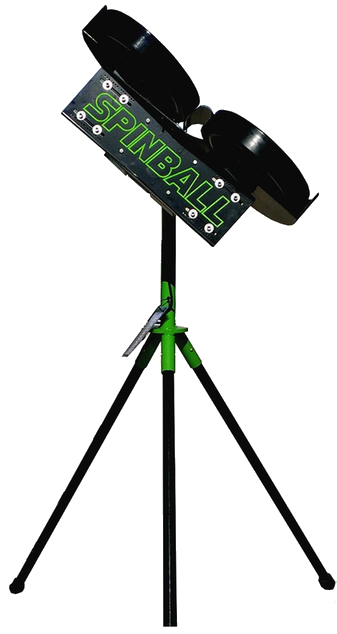 All of the softball and baseball pitching machines for sale here are constructed of quality material with strong steel legs that are made to last. In addition, all of our pitching machines and batting cages have extended manufacturer warranties. Because few of us live on multiple acre properties, our batting cages offer a safe setting to practice your game right in your own backyard. Easy and quick to assemble, the Heater Sports batting cage series allows you to practice in an area as small as 12 feet long or as long as 72 feet. You can even use any of their batting cages as a golf net and work on your golf game, too. Like their pitching machines, Heater batting cages are designed to last. Made of durable fiberglass with polyethylene netting, Heater Sports batting cages can withstand the elements! If you are looking for a batting cage that is a bit more rugged, you should definitely consider Cimarron Sports Batting cages. Available as complete batting cage packages or more economical batting cage kits, Cimarron batting cages and baseball/softball screens feature all-steel design that will last for many, many years. Better still, they offer a variety of net strengths so that you can get the durability you need for the skill level of your players and the climate it will be used in. We offer a multitude of pitching machine and batting cage combination packages that feature our pitching machines and batting cages as well as several popular baseball swing training aids to further develop your hand-eye coordination. From softballs to baseballs, fastballs to curves and backyards to Major League ball clubs, our batting machines and cages provide a solution for everybody. If you have any questions, please don't hesitate to contact us; we're here to help you in any way that we can and love helping people select the perfect pitching machine for their situation and budget!